Burnley defender Michael Keane has been backed in to favourite with many bookmakers to rejoin former club Manchester United in the summer. The 24-year-old, signed from Old Trafford in September 2014, is now priced at 5/4 with Paddy Power and SkyBet to return to the Red Devils, the club he won the FA Youth cup with, alongside Paul Pogba, six years ago. Keane is just two games away from making his 100th league appearance for the Clarets, with the arrival of Jose Mourinho’s men on Sunday presumably moving the England international even closer to the milestone. 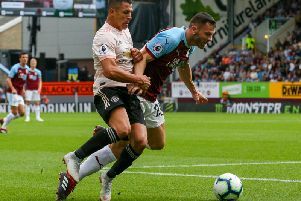 Keane, who has scored seven times for the Clarets, including two in the Premier League, saw his form this season recognised by Three Lions boss Gareth Southgate. The centre back, who still has a year remaining on his contract at Turf Moor, received two caps for his country when appearing against Germany and Lithuania last month. Increased interest in Keane, who has also attracted the likes of Everton, could spark a bidding war and, if a hard-to-refuse fee is offered to the club, the defender is likely to move for three or four times the record sum received from tribunal for striker Danny Ings.